On January 21, 2017, many members of the Vintage Style Council joined millions of people around the world to march for human rights and civil liberties. 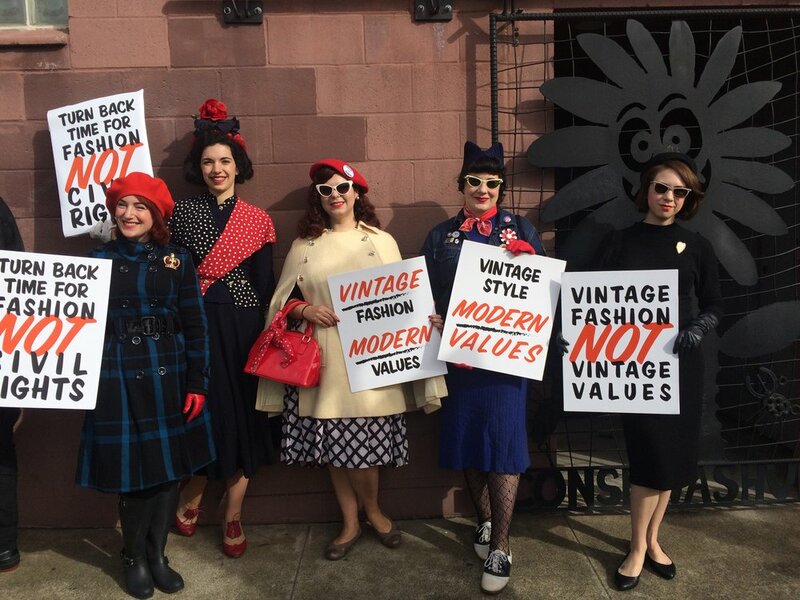 More than 80,000 people participated in the peaceful Women's March through beautiful downtown Oakland, and the ladies of the VSC were joined by our spouses, partners, family, and other friends in the vintage community to advocate for vintage style – not vintage values! Our mission was exemplified by the fantastic signs made by VSC member Brianne, which caused quite a stir throughout the march! Although we prefer the fashion and style of bygone eras, we are thoroughly modern ladies who expect to continue to enjoy the civil liberties that our mothers and grandmothers fought so hard for. The Women's March was the perfect follow up to our hugely successful ACLU benefit just a week earlier – and you can expect to continue to see us out advocating in style!